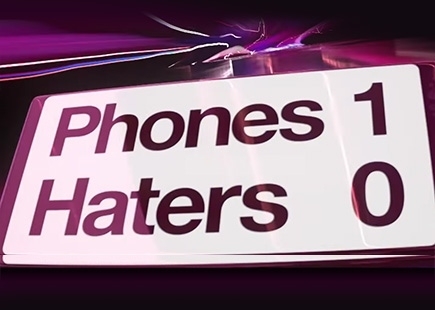 Is Three's "Phones are good" campaign funny, irresponsible or both? The headmistress of a girls’ primary school, from which my ten year old is about to depart, said to me recently that the consequences that she had observed of the internet for children’s behaviour, even of my youngest daughter’s age, are a decline in their command of the language, a reduced ability to engage with others in their peer group and an increasing lack of patience when seeking an answer to a question. All recognisable and all sort of understandable when you consider the growth of tablet and smartphone use, even amongst ten year olds. Hang on. Who’s telling us to get off our phones (other than anxious teachers)...and why? And is Three’s response, which is most certainly an engaging piece of content, also intellectually sound? I wouldn’t claim for one moment to have undertaken comprehensive research into the health risks of wireless, but isn’t there a danger, if this is part of Three’s agenda (which it seems to be, looking at the CMO’s comments) that it may be seen as trivialising the problem, or do consumers simply not care? That’s pretty strong stuff and I would suggest dangerous territory for any network brand to get near. Whilst I am not suggesting for a moment that this was the sole motive behind the Three strapline that ‘Phones are good for you’, rather than for instance the social consequences of mobile phones, it seems to me to be a direct response to the feeling that phones are bad for your health. Nevertheless, I loved the ad, because it made me smile. It had exactly the same effect on everyone else I showed it to. The idea is simple and one we can all identify with. Isn’t it fun to rewrite history? It’s why the Back to the Future franchise was so successful 30 years ago. The film demonstrates how much better things would have been if mobile phones had existed in bygone times. The first ad I viewed was a two-and-a-half minute piece on YouTube, so it had to be good to hold my attention for so much longer than the average dwell time. It was and it did. The phone travels back through time. The first scene on the bridge of Titanic, where the phone screen shows a hazard ahead, has the captain, in typical laconic David Niven style, muttering to the officer next to him ‘Oh gosh. Best avoid that. Turn left’. 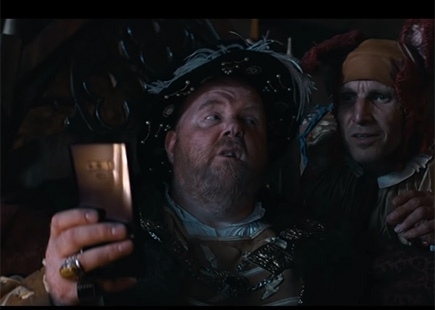 The film moves from there to starving cavemen ordering Deliveroo and Henry VIII browsing for new wives on Tinder, thereby preventing their executions, with the unforgettable claim that ‘Phones saves wives’. As well as social, 60- and 30-second spots are being used on TV and on cinema. 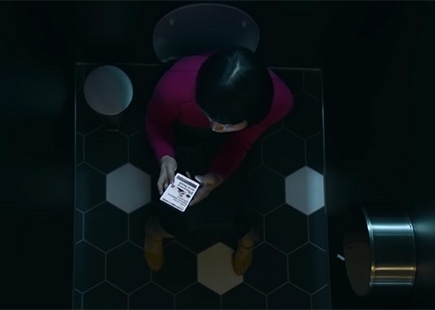 Three also partnered with Instagram, Deliveroo, Snapchat, LinkedIn, Tinder and Google Maps with each of the apps being featured in different scenes. A creative twist was given to the in-store execution. London artist Reuben Dangoor was commissioned to reimagine historical figures through the lens of social media profile pictures, whilst mobile technology was used to reimagine historical paintings which were used to give some major stores a gallery-style takeover. Ad agency Wieden and Kennedy’s Tom Bender and Tom Corcoran created the ad. Ian Pons Jewell directed the film through agency Friend. It is exceedingly well shot. It moves with great pace with some sharp editing and a hypnotic soundtrack. The production values are excellent. According to Shadi Halliwell, 40% of customers reject Three because of its reputation legacy and the intention of the campaign is to attract high-value customers, particularly tech-savvy older millennials. Evidence also suggests that Three customers use far more data than those of other networks. ‘Our customers have more fun’ Halliwell claims. Hence the tone of voice of the campaign which is intended to reflect this brand personality and successfully does so. I think above all else, one has to acknowledge that this is a brave (some may say foolhardy) piece of advertising. 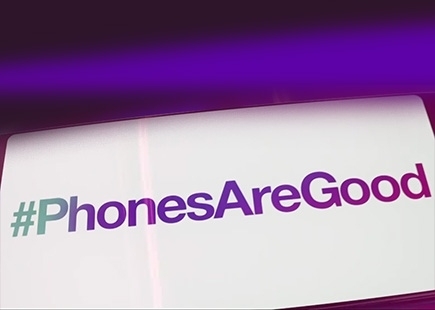 The brand could have settled for minimising the negatives rather than accentuating the positives of mobile phones. It has chosen not to and the agency, as the advocate of the resulting proposition, has done a very good job. Maybe I’m just a wimp. But in a world where corporate social responsibility increasingly matters, making a joke about phones being good for you, when there is genuine (scientifically backed) concern about how bad they might be for our health seems to me a hostage to fortune. 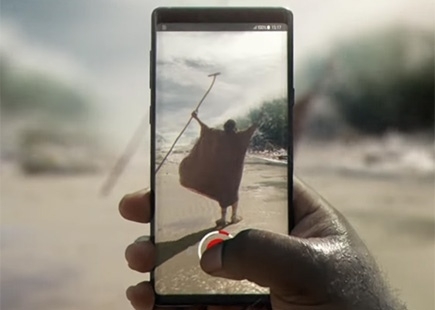 Was the brief to show how mobile phones have improved life or did the agency and client team collectively agree that someone in the industry needed to make a stand against the negative publicity and bring some balance to the debate? The more I look at this the more it seems to me to be the latter. The agency, as the advocate for the defence, has presented its case magnificently and thereby fulfilled its responsibility. But, does that make us feel any more positive about the case that is being made in support of mobile and less concerned about the negatives? Or does the industry overall need to take a more responsible approach and acknowledge that risks exist and advise the billions of customers around the world on how to modify their behaviour so as best to mitigate these?